Chia seed pudding can be made with nearly any liquid. Just use 1/4 cup chia seeds to 1 cup liquid and let sit for at least 3 hours to thicken. I threw 1/2 a cup of fresh blueberries into a small saucepan with a tablespoon of sugar and a tablespoon of water. 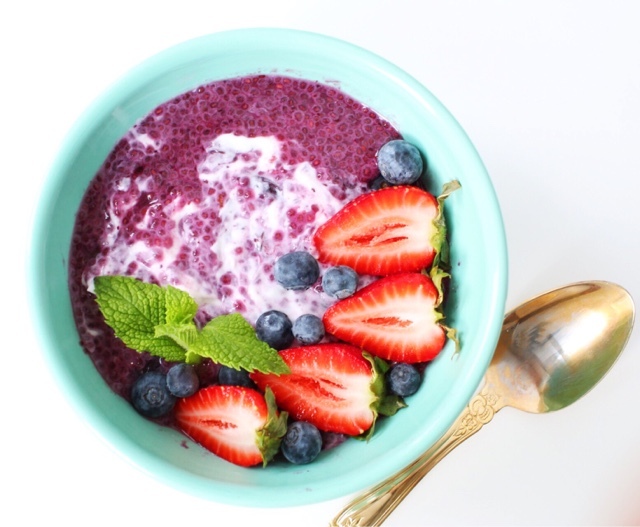 Cook until blueberries burst and add to chia seeds. I topped that off with another 2/3 cup of almond milk and let it set. Top with greek yogurt and fresh fruit to serve.